I always have scads of images in reserve, most of which never appear here. This series of Turkey Vulture photos was among them. I liked the way the shots came out, and as this is one of my favorite birds, I could not go without sharing them. And what better day to do so than on Christmas, in spite of the possibility of perceived symbolism. The images were made at the Wilds back in November. The vulture was quite cooperative, but I was using the car as a blind and shooting out the window. Had I been on foot, the vulture would not have let me get near this close. I like the "bokeh" effect of the shots. Bokeh is modified from the Japanese word boke, which basically means blur, and refers to the quality of an image's background. In the case of these images, the pleasing (to me, at least) gray-green background is the aggregate of fields of browning fescue grasses, interspersed with occasional autumn-olive shrubs. The images were made with Canon's 500mm f/4 II, with 1.4 teleconverter, which makes for a focal length of 700mm. The depth of field with this setup is quite shallow, hence the pleasing bokeh. A face only a mother vulture could love, but that ugly mug is efficient. 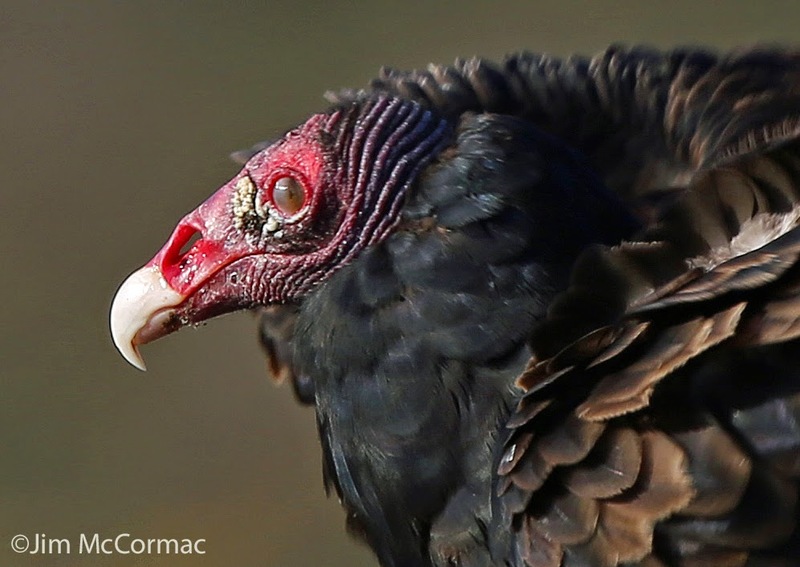 Turkey Vultures are strict carrion eaters, and their fare is often rather messy. It is easier to keep a face of bare skin clean than would be the case of it were densely feathered. Note the massive nostril. Vultures find their food by sense of smell, and they're quite accomplished in the olfactory department. Even malodorous carcasses that are hidden from view are unerringly keyed in on. One could write a book about just this species of vulture, as they have so many interesting facets to their lives. 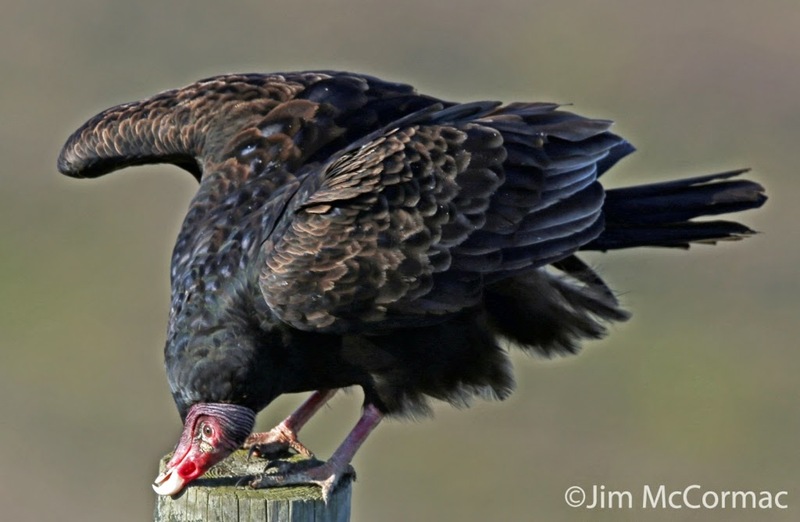 For me, as a young lad, Turkey Vultures were an endless source of fascination. I would lie on my back under big blue skies and watch them trace lazy loops high in the ether. Their flight is effortless, often not involving as much as a flap of the wings for many minutes on end. I thought that, if one had the opportunity to be a bird, Cathartes aura might not be a bad choice. Yes, the menu might leave something to be desired, but that's just the egocentric take of Homo sapiens. To the vulture, a fermenting opossum is t-bone steak. All or nearly all vultures in my central Ohio neck of the woods have fled south for the winter. But it won't be long and they'll be returning in force. 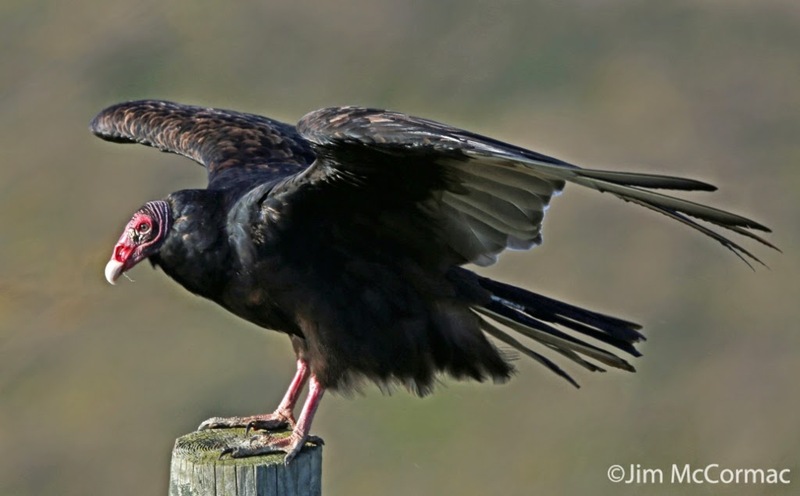 The Turkey Vulture is an early harbinger-of-spring, riding back into town on the first mild winds of late February, their appearance a precursor of an ever-increasing cascade of vernal migrants. A recent project had me going through scads of photos, and in the process I came across a number of landscape images. Some of which I really like, and maybe you will, too. Some of these photos have made their way to this blog in the past; others, not. As always, you can click on the photo to enlarge it. Fall colors at Rhododendron Cove State Nature Preserve, Fairfield County, Ohio. This is an oldie, but to me at least, a goodie. I really like the way that the image came out, even if it was blind luck. It dates to 2007, which for me was the Bronze Age of photography. The image was made with a Panasonic FZ-30 point & shoot, and I really didn't have much awareness of the Big Three back then: ISO, shutter speed, and aperture. The camera's settings reflect my ignorance: f/2.8; 1/30 shutter speed; ISO 125. I could have gotten away with a much smaller aperture (higher f-stop number), which would have probably given greater clarity to the scene. But it worked out anyway, and the extremely shallow depth of field gives the image a hazy, dreamy look. 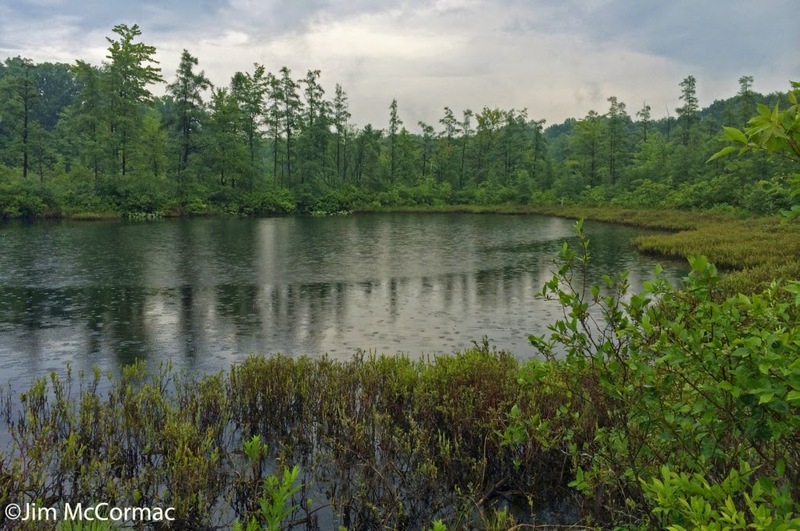 Triangle Lake Bog State Nature Preserve, Portage County, Ohio, in the rain. This is from June of this year. I had met a friend here, and we planned on exploring the bog's wonders. But it was a day marked by downpours punctuated by brief rainless interludes. During one of those respites from the rain, we circled the boardwalk, but I didn't want to bring any of my camera gear for fear of getting caught in a deluge. So, this image was made with my iPhone 5S camera. Not bad for a camera phone. A technicolor late fall day on the prairie; Killdeer Plains Wildlife Area, Wyandot County, Ohio. I liked the interplay between the blue sky and the waters of the pond, and framed the image to try and make one complement the other. The presence of the big white fluffy cumulus clouds was a bonus. When making images in such a situation, it is well worth while waiting until a particularly pleasing cloud drifts into position. Also, when presented with such a beautiful sky and light, it is good to make sure that much of the sky is captured in the shot. This photo would adhere well to the rule of thirds. Revisit the previous photo with the gray stormy sky. In that case, I only included as much sky as necessary. The shot was taken with the Canon 5D Mark III, 17-40 f/4 lens at a focal length of 26 mm, f/11, 1/250 shutter speed, and ISO of 100. 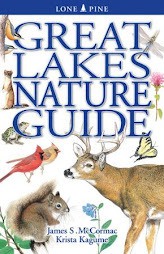 Botanical nuggets of gold, hundreds of Lakeside Daisies, Tetraneuris herbacea, stretch into the distance. 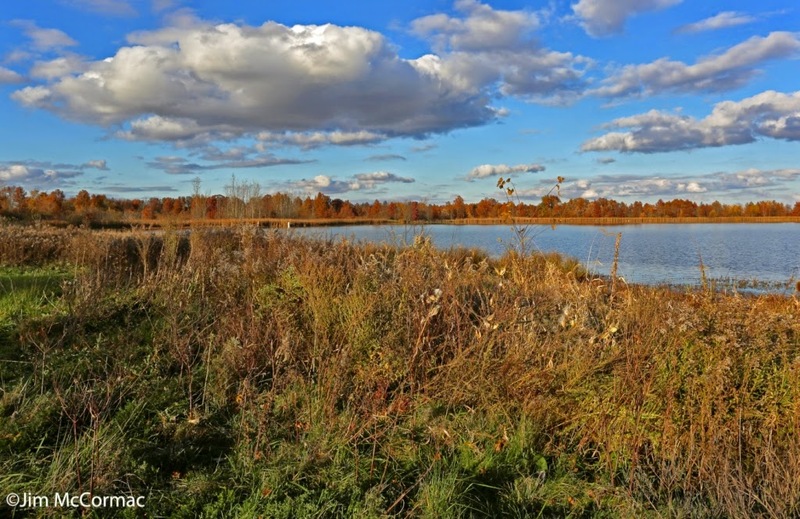 This photo was made at the Lakeside Daisy State Nature Preserve in Ottawa County, Ohio. 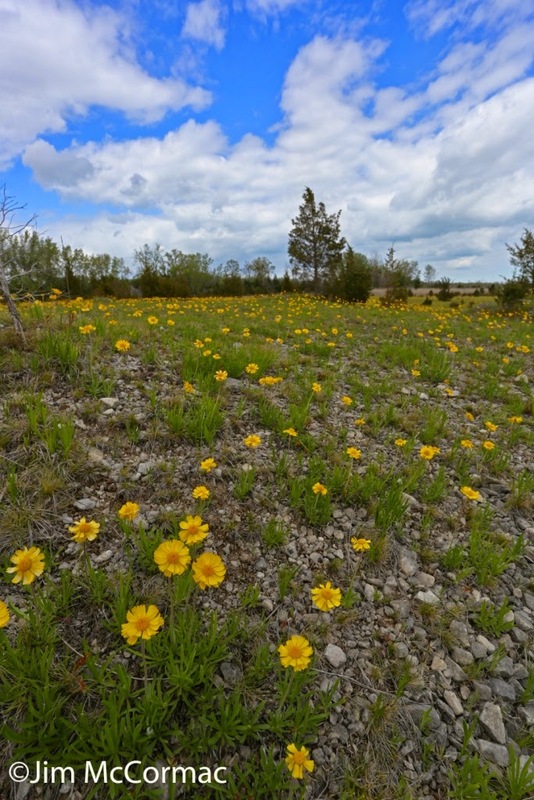 This landscape, at least in mid-May when the daisies are peak, offers myriad possibilities when it comes to composition. While this shot is a vertical, horizontal compositions can be even more striking. I wanted to give the impression of depth, though, and felt that the vertical frame better provided that. This shot was made with the Canon 5D Mark III, 17-40 f/4 lens at a focal length of 17 mm, f/11, 1/250 shutter speed, and ISO 200. October 25, 2014 was a fine day to be outdoors, and that's when I made this image. 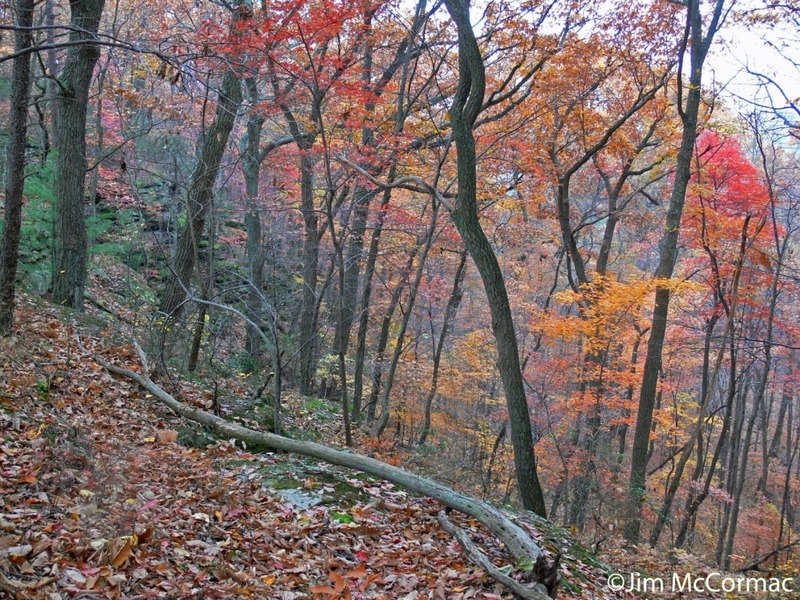 It was taken along the trail to Buzzardroost Rock in the sprawling Edge of Appalachia Preserve in Adams County, Ohio. Many trees were at peak color, and progress was slow as I scanned for the "perfect" fall leaf color composition. This group of hickories, maples, and oaks grabbed my eye, and I ended up lying on my back in the leaf litter to gain what I thought was the best perspective. The shot was made with the Canon 5D Mark III and my trusty 17-40L wide-angle landscape lens with a focal length of 17 mm. A lens that is capable of a 17 or 18 mm focal length for an ultra wide-angle perspective is a must for certain landscape portraits. The settings for this shot were f/8, 1/200 shutter speed, and ISO of 100. Kent Bog State Nature Preserve, Portage County, Ohio. Normally I don't like sticking a boardwalk, roadway, or other "line" straight down the middle of a photograph. In this case, I liked the effect. The pale-barked Gray Birch, Betula populifolia, look as if they are recoiling from the planks' intrusion. 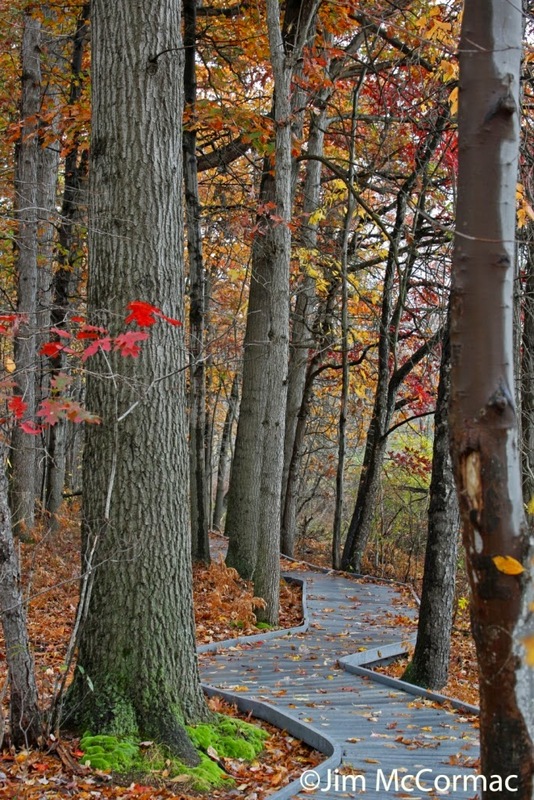 The birch's spent yellow leaves provide aesthetically pleasing litter on the trail. This was another day of rain and terrible light, so by pointing the wide-angle lens nearly at my feet, I could begin the shot near the observer, carry off into the distance, and still minimize the role of the leaden skies. This was taken with the Canon 5D Mark III at f/8, 1/320, and ISO 400 with the lens at a focal length of 17 mm. 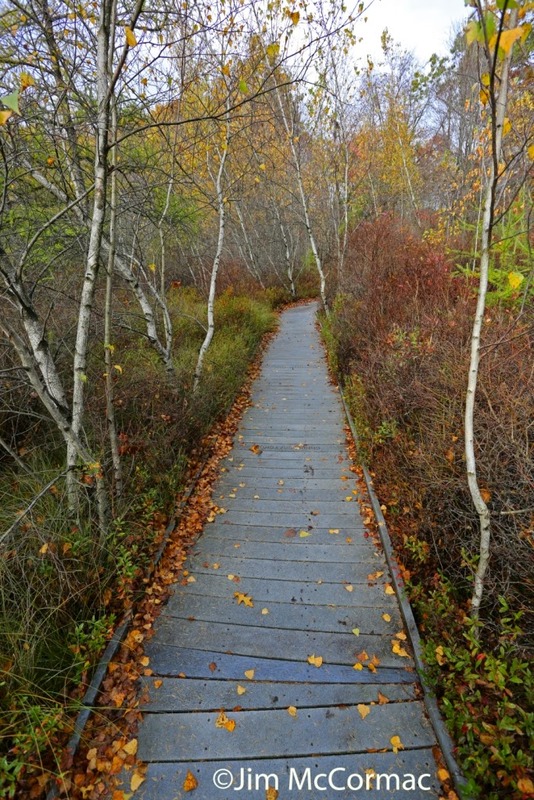 This shot was made elsewhere on Kent Bog's boardwalk, on the same day as the previous shot. I thought that the kink in this section of boardwalk broke an otherwise straight line, and created interest. As I moved around and scanned perspectives through the viewfinder, that patch of emerald moss at the base of the oak caught my eye. The brilliant red leaves of a Red Maple, Acer rubrum, were fortuitously located directly in front of the oak's trunk. The image was made with my 5D, f/8, 1/80, and ISO 400. I used my Tamron 70-200mm f/2.8 lens. That lens is an awesome piece of hardware, and works great for capturing landscapes in a much different way than a wide-angle. Its focal length was set to 70 mm for this picture. While possibly not the greatest of shots, I like it. 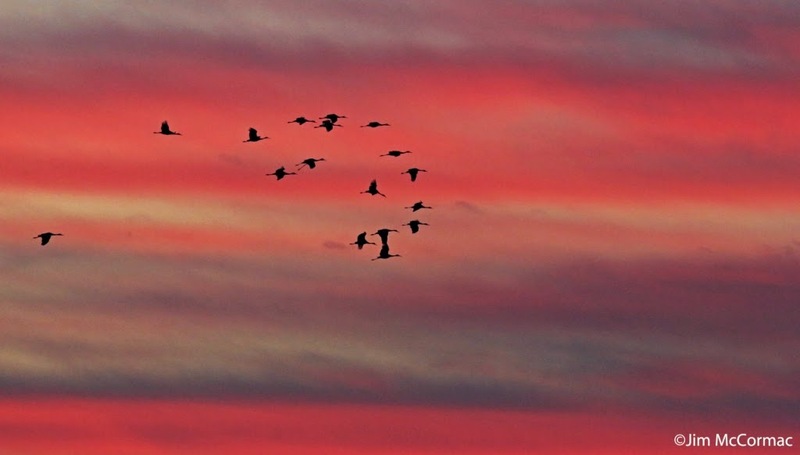 A squadron of Sandhill Cranes flies against an insanely colorful Indiana sunset at Jasper Pulaski Wildlife Refuge in Indiana last month. The day had been mostly gray, cloudy, and dreary. For a brief interlude at day's end, the sun lit up the clouds and painted the western sky a riot of warm colors. There was only a few minutes when it looked like this, and precious little opportunity to click off a few shots when cranes were positioned properly. This one was made with my 5D bolted to the spectacular 500 f/4 II telephoto lens, set to f/11, 1/500, and ISO 6400. Those cranes were probably 1/3rd of a mile distant. On November 18, I was freezing in the parking lot by the Eastlake Power Plant on Lake Erie, taking photo after photo of flying gulls. The temperature was in the teens, it was towards day's end, and light was fading fast. I was shooting away from the sun, for better light on the birds. Finally I glanced back to the west, and saw this. 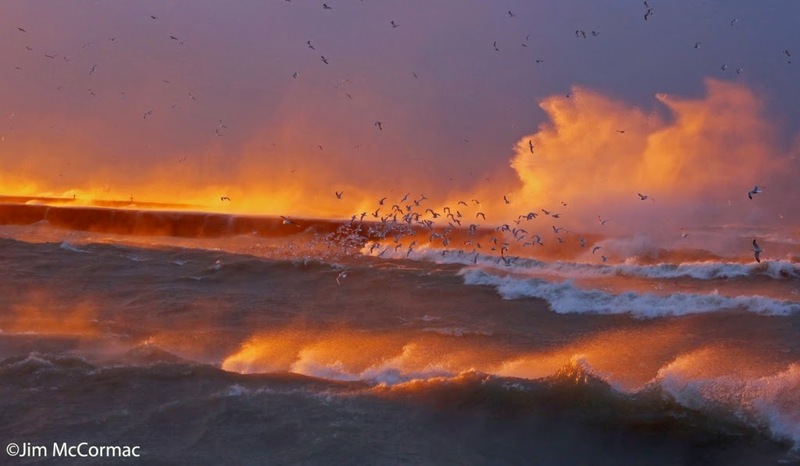 Gale force winds were pulverizing waves against a distant breakwall, blowing surf 20 to 30 feet in the air. Wave crests were atomizing against the ferocious wind, and everything was lit orange and yellow by the setting sun. Gulls, unperturbed as always by weather that would kill you or me in minutes if unprotected, added another element to the landscape. When I noticed the spectacular interplay of water, light, and birds, my camera was mounted on a tripod and rigged with the 500mm telephoto. I rushed to change over to the Tamron 70-200mm, and in the five or so minutes when things looked like this, clicked off dozens of images. The waves and position of the gulls would change by the second, and I was trying to get shots as dramatic as possible, especially trying for images that captured massive eruptions of water as a wave collided with the breakwall. It isn't often that one lucks into such a dramatic scene, and it was well worth dealing with the tough weather to experience this. For this shot, it was the 5D with aforementioned 70-200 lens set to a 95mm focal length, f/7.1, 1/320, and ISO 2000. A good-sized American Elm, Ulmus americana, stands alone on a field edge. Its whiskbroom shape is apparent even from afar. I tend to notice big elms, and generally pay them more than a passing glance. 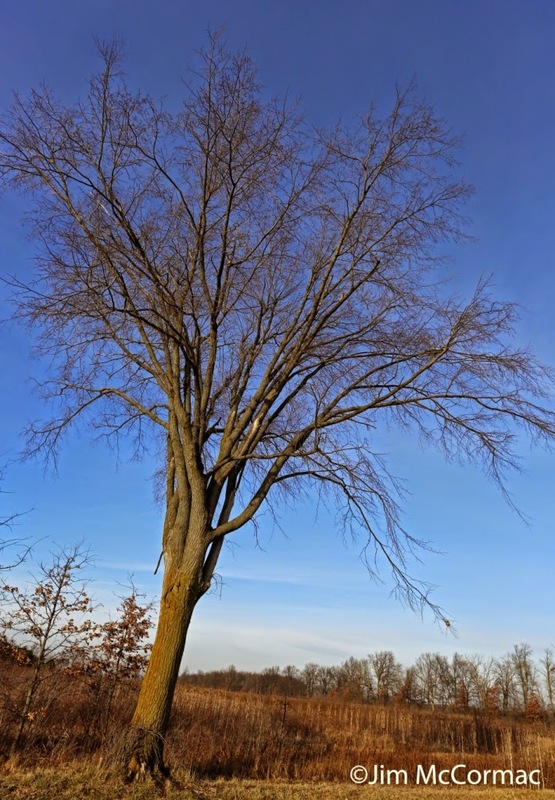 The American Elm is still a very common tree in Ohio, but big ones are scarce. In 1928, Dutch Elm Disease was first detected in North America, and it spread like wildfire. It is caused by three species of microfungi, two of which afflict trees on this continent. The fungi is spread by a trio of bark beetles. Once a tree is infected, the tree attempts to thwart the spread of the invader by plugging its xylem channels, which transport various nutrients and water throughout the plant. This ultimately fails, and the elm dies. Trees usually succumb before reaching the size of the specimen in this photo, which I found last Thursday at Killdeer Plains Wildlife Area. Most large elms that I see are isolated like this one is; it may be more difficult for the vector beetles to reach them. When I slowed to admire the stately tree, I noticed it bore a nest. You can see it in the branches furthest to the right in the photo. This is not the first time that I have seen such a nest in a surviving mature elm. In fact, when I do find such a tree I scan it specifically for this type of nest. A work of art indeed! The beautifully woven basket of a Baltimore Oriole, suspended from the elm's slender branches. The fact that it is still in the tree, and in good shape at this late date, is a testament to the oriole's basket-weaving skills. There is no question that Baltimore Orioles have a propensity for siting their nests in the boughs of American Elms. Before Dutch Elm Disease appeared on the continent and laid waste to our elms, this tree was commonly used as a street tree. Avenues and boulevards would be lined with elms, their overarching branches connecting to form a shady arbor over the roadway. 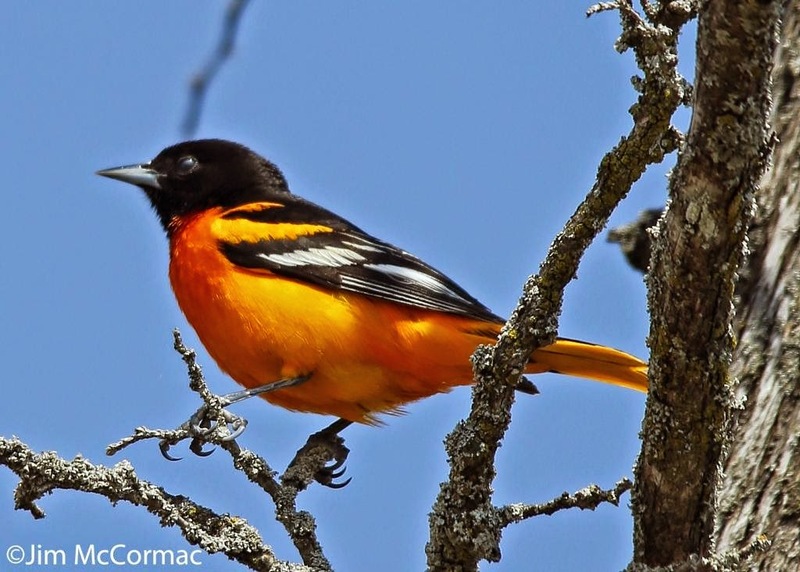 Numerous accounts describe the colorful orioles that graced the elms, delighting people with their musical flutelike whistling and brilliant splashes of orange. 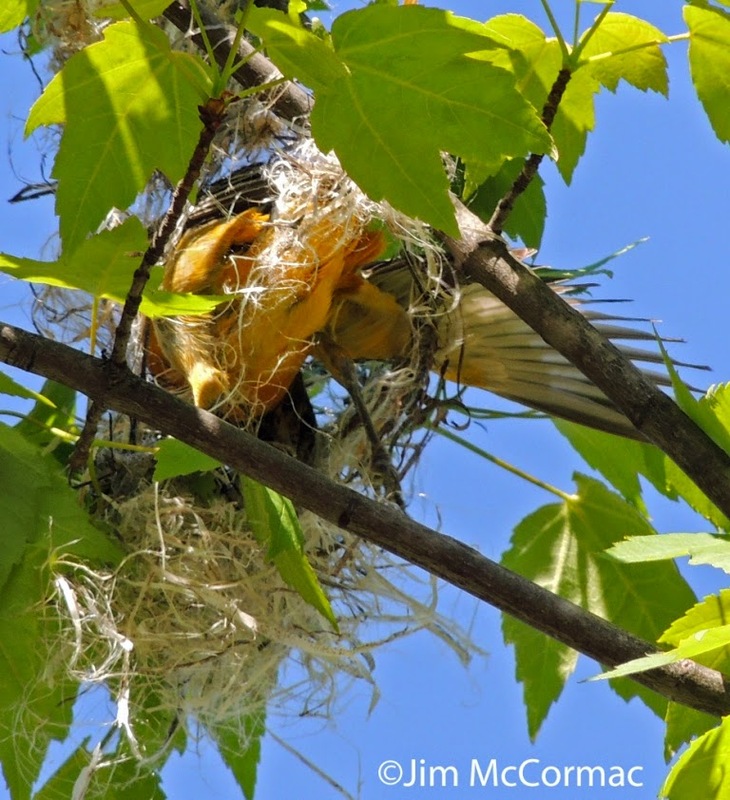 A paper entitled The Nesting Habits of the Baltimore Oriole appeared in a 1930 issue (vol. 42:4) of the Wilson Bulletin. 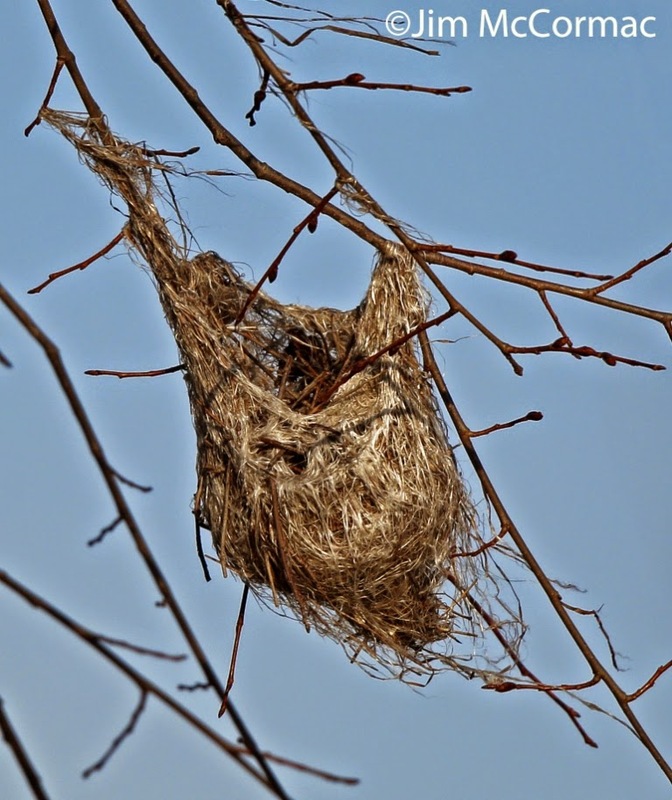 In it, the author describes nine nests that occurred along a street in Sigourney, Iowa in the summer of 1927 (pre-DED). Eight of the nests were located in American Elms. Such pro-elm favoritism was probably the rule in midwestern towns and cities prior to DED. Why the orioles' preference for elms? Probably for safety's sake. The spindly, drooping ultimate branches of elms prohibit access to many predators. A raccoon would certainly never make it to a nest such as shown in my photo. Nor would that most effective of avian nest predators, the black ratsnake, I would guess. Fortunately orioles have proven to be adaptive, and have jumped the arboreal ship to other trees for nesting purposes. A favorite is the Eastern Cottonwood, Populus deltoides. I have watched orioles create their ornate hanging baskets on a number of occasions, and it is a remarkable thing to observe. Here, a female busily weaves her nest in a maple in northern Michigan. Somehow she takes an insensible tangle of grasses and plant fibers, and in a flurry of activity crafts a sturdy, well designed cup from the mess in just a few days. I couldn't do such a thing armed with my ten fingers. The oriole's intricate cup spawns one of the world's most colorful blackbirds, named for the colors of the coat of arms of Sir George Calvert, who was the first lord of the Baltimore colony. The females, who one might argue do most of the heavy lifting in the oriole's world, are much more muted in plumage than is this showy male. No dummies, most of our Baltimore Orioles are now in the tropics of Central America where they will ride out the winter. Come late April, their cheery whistles will once again ring from the Ohio treetops, every bit the harbinger-of-spring. This juvenile Red-headed Woodpecker was one of many busily harvesting acorns today at Killdeer Plains Wildlife Area. 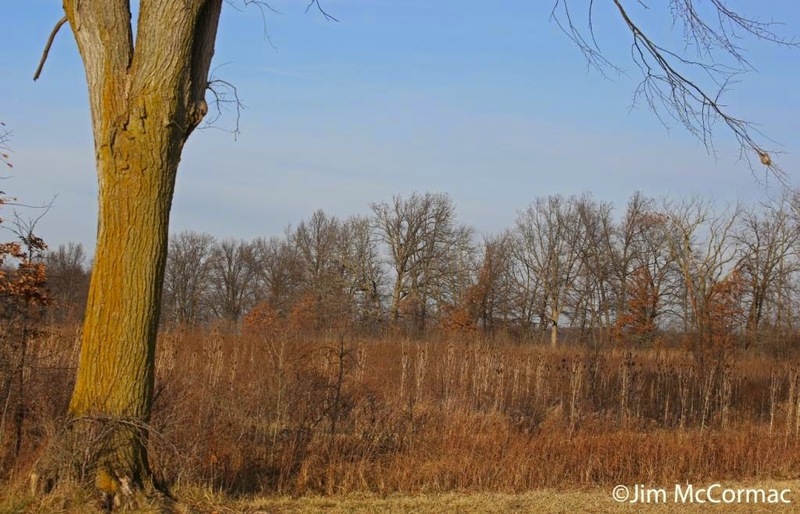 Oak of several species are plentiful throughout the 9,000+ acre wildlife area, and every woodlot has its complement of woodpeckers. This was a banner year for the acorn crops, so there is lots of work for the red-heads. Red-headed Woodpeckers cache food, and they were industriously wedging acorns into nooks and crannies of various granary trees. Assuming the birds can remember their locations, and I'm sure they do, for the most part, these acorns will be welcome foodstuff during bleak winter weather. You can probably file the following video under strange things almost no one ever gets to see. The beloved Striped Skunk, those handsome if not occasionally malodorous black and white beasts, are well known for their digging propensities. If skunks are about, and hungry, it is common to see the aftermath of their hunting: small divots pawed into the ground where the animals have dug out tasty beetle grubs or other fare. But a skunk is not a one-trick pony when it comes to feeding skills. They'll take about anything they can find, and that includes eggs. If, for instance, a skunk stumbles into a turkey nest, it'll likely grab the eggs, or at least one of them. The Hughes - David and Laura - consistently outdo themselves in capturing outstanding trail cam videography. I've featured their work here many times; type "Hughes" into the blog's search box in the upper left corner of the page and you'll find plenty of examples. In this case, they've left some old guinea fowl eggs along the game trail, to see what might take the bait. A skunk ambles along, seizes an egg, and begins playing the part of an NFL center with it. This is apparently a known behavior for Striped Skunks - hurling hard-shelled food backwards between their legs. The animal would normally fling the item into a path of great resistance, such as a rock or tree trunk, in an effort to smash the object open. The subject of this film doesn't have a good smashing surface close at hand, but that doesn't stop it from hiking its egg. BONUS: A Virginia Opossum enters the scene towards the video's end, and almost gets whacked by one of the skunk's errant egg hikes. 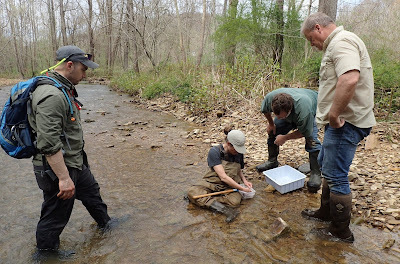 Great stuff, and thanks to Laura for sending along the video and allowing me to share. 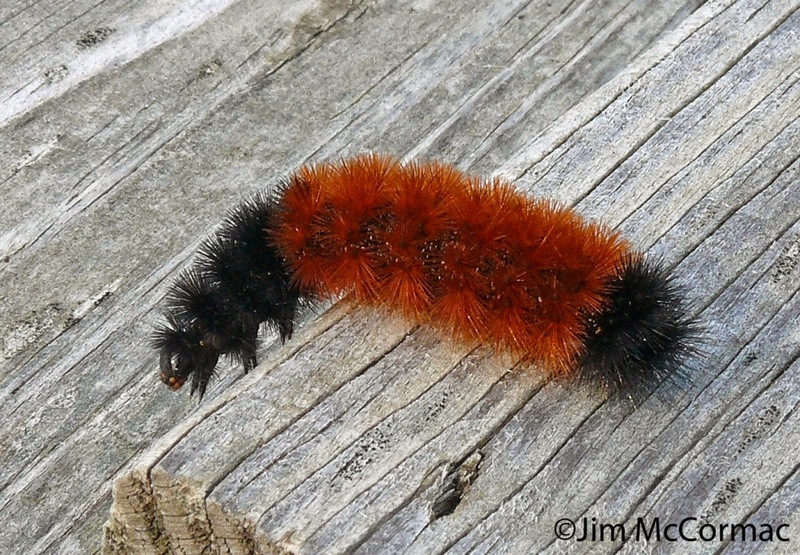 Ah, the Woolly-bear, Pyrrharctia isabella, America's most beloved caterpillar. The tubular little beasts are impeccably zoned into neat patterns of burnt-orange and black, making for a darn good-looking larva. Woolly-bears are also undoubtedly the most widely recognized of North America's thousands of species of caterpillars, and that's due to their supposed ability to prognosticate the coming winter weather. The wider the orange band, the milder the winter, so the folklore goes. If that were true the bear in this photo would be calling for a balmy winter. 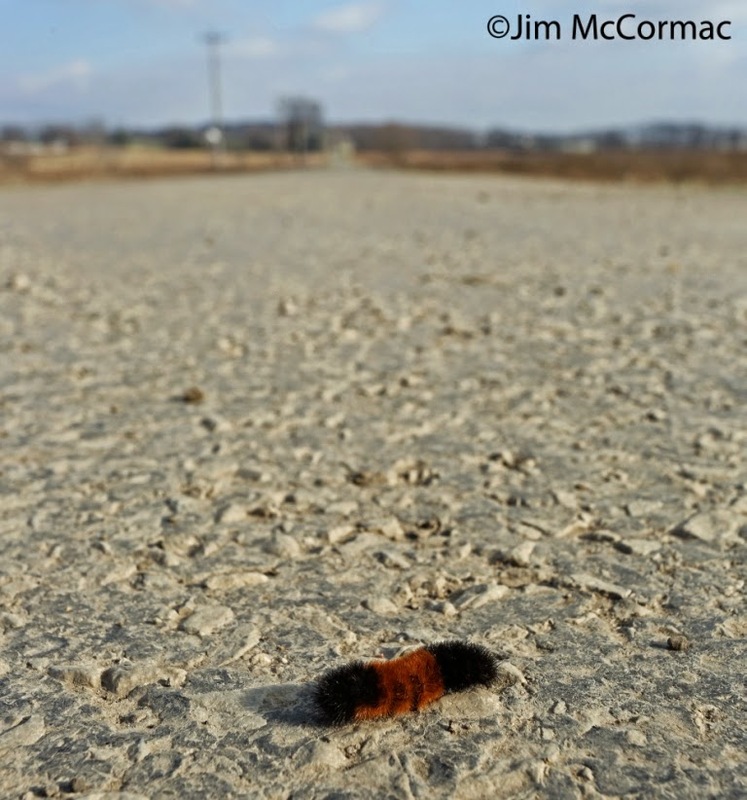 Not to burst any bubbles, or cast aspersions on any of the Woolly-bear festivals that have sprung up (one in Vermilion, Ohio - the "Woollybear Festival" - began in 1973), but there is no credibility to the caterpillars' role as weather forecaster. The widths of the colored bands are unrelated to future weather. Their size is much more aligned with their age. Caterpillars grow through various stages, each termed an instar. Five instars/stages is a common number of growth phases for most of our caterpillars. 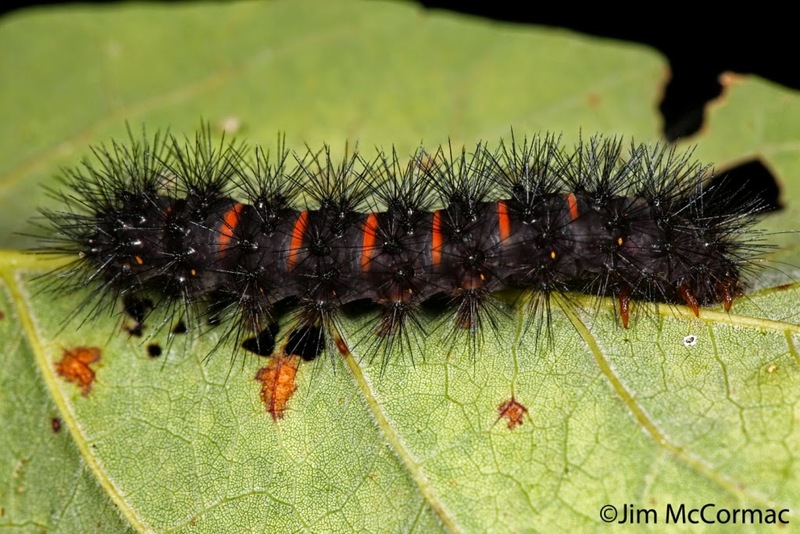 As they grow, and shed their "skin" between instars, caterpillars often change appearance markedly. In the case of the Woolly-bear, the black bands widen with age, and thus older caterpillars are darker. Dark old specimens might lead one to believe a brutal winter is on tap. Get any sort of semi-warm snap, especially with sun, this time of year and out come the bears. 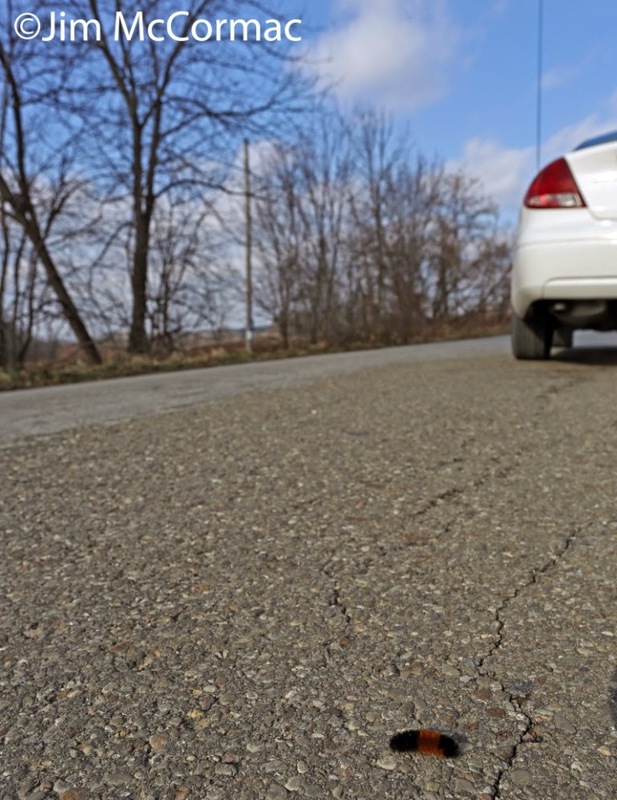 It is very common to see Woolly-bears legging it across roadways under such weather conditions in early winter. I was able to stop at a few interesting places on my way to Canton last Wednesday afternoon, and saw numerous bears crossing roads. The temperature when I made this photo was only about 40 F.
For reasons unknown, Woolly-bear caterpillars are inveterate wanderers in fall and early winter. 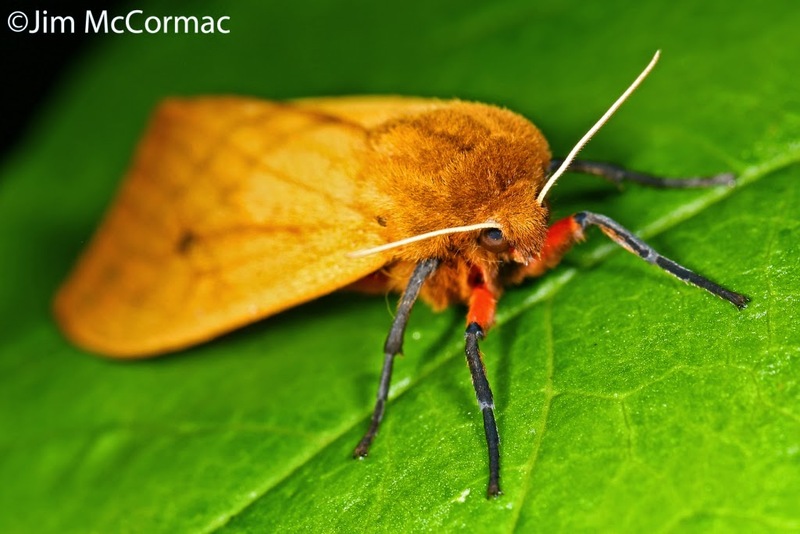 It doesn't seem to make much sense, as these caterpillars can eat an enormous variety of very common plant life, so there would seem to be little reason to risk the numerous threats that come with roaming far and wide. But nomads they are, and they know better than we what they are supposed to be doing. The issue of the Woolly-bears' alleged skills as winter forecasters is also muddied by misidentifications. Unfortunately, not all people pay close attention to detail (just watch Fox News for proof! ), and as distinctive as Woolly-bears are, there are similar species. The one above is a Giant Leopard Moth caterpillar, Hypercompe scribonia, and it too wanders widely in late fall/early winter. Some people will see one of these and instantly think the White Death will soon be upon us. 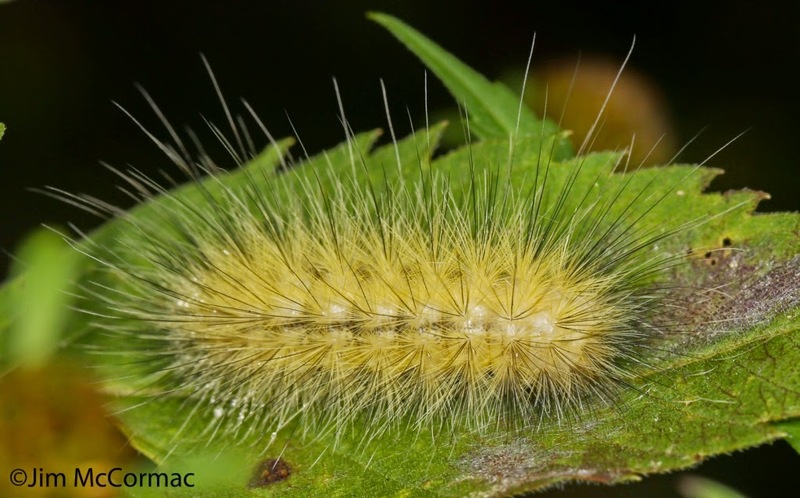 Another common ground-roaming fall caterpillar is that of the Virginia Tiger Moth, Spilosoma virginica, which is known as the "Yellow Bear". Were a true Woolly-bear believer to see this one, its nearly solid yellowish color might convince them that winter is slated to be quite Floridian. This one, believe it or not, is another "Yellow Bear", but it might be better termed a Black Bear. 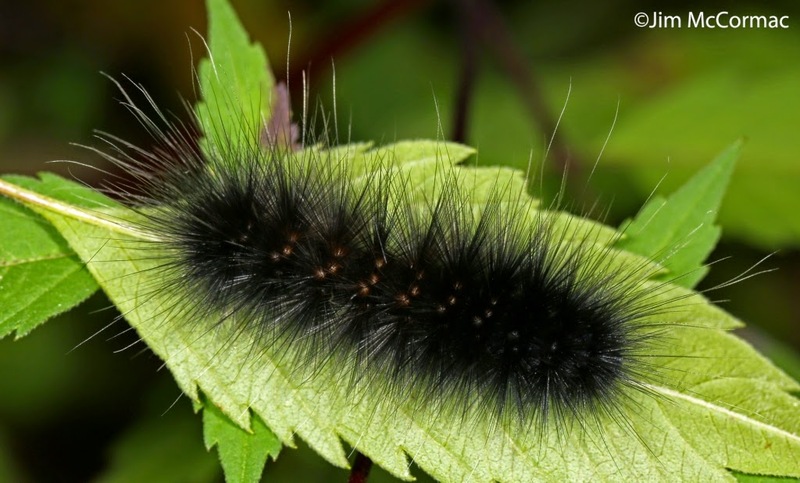 The caterpillars of Spilosoma virginica are incredibly variable in coloration, and thus this one species is capable of fooling lepidopteran-illiterate Woolly-bear fans into believing the upcoming winter will be incredibly brutal, or unnaturally balmy. Free-ranging Woolly-bears face great hazard when attempting to cross roads hundreds of times wider than they are. The mortality is high, but fortunately Woolly-bears are abundant. Vehicular carnage seems to dent their population very little. If they do make it to the other side, the bear will seek a sheltered spot to overwinter. That's right, this species rides out the winter that it is supposed to be forecasting as a fully grown caterpillar. The Woolly-bear can essentially freeze solid, and cryoprotectant chemicals in its system prevent irreparable damage to its vitals. If all goes well for the Woolly-bear, come spring and warmer weather it will pupate and later emerge as this gorgeous moth, the Isabella Tiger Moth. I suspect very few people would recognize the moth, even though vast numbers of them would instantly identify the caterpillar. 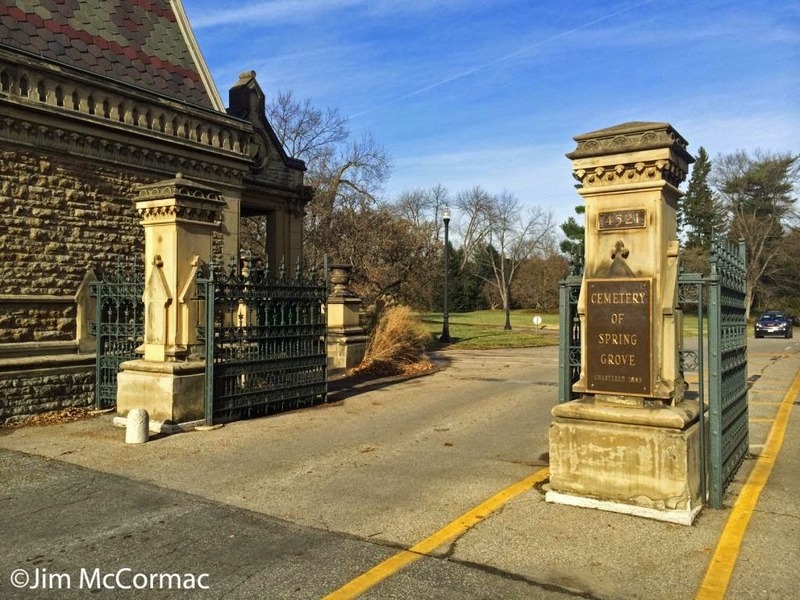 The impressive entrance to Spring Grove Cemetery in Cincinnati. When passing through these battleship-like gates you know you've arrived somewhere of note. Of course, for most of the residents it's a one-way street. I was down here recently for a meeting, and we allowed enough time to tour some of the sights. Spring Grove is the largest cemetery in Ohio, at over 700 acres, and it is probably considered as much park as cemetery. It harks back to the olden days, when cemeteries were used for picnics, weddings, and nice oases free from the hustle and bustle of the city. We had some knowledgeable guides for our foray into the cemtery, including Ned Keller and Kathy McDonald, Judy Ganance, and Solomon Gamboa. When you're dealing with small roads winding in an abstract fashion through 700 acres, it takes a while to learn the lay of the land. 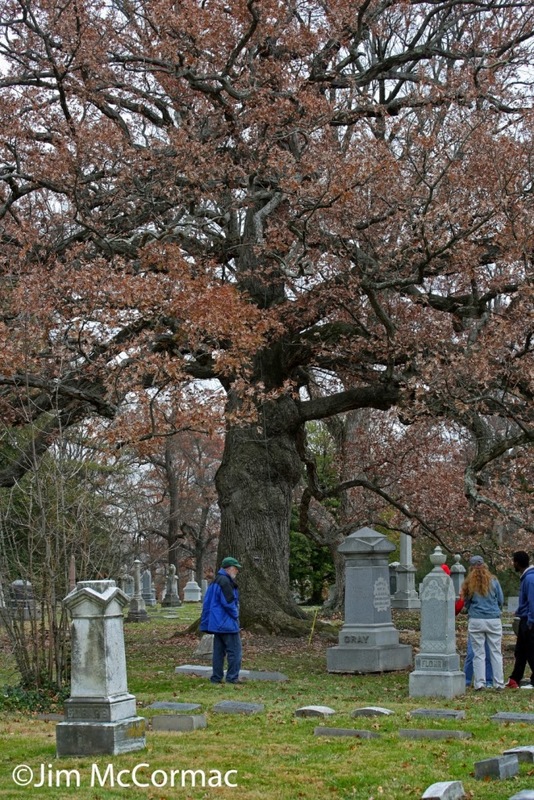 But thanks to our guides, we were able to navigate directly to some of the cemetery's highlights, including the massive white oak, Quercus alba, in this photo. It utterly dwarfs our group. The tree is several hundred years old. Although it is not the state champion (largest of its species), Spring Grove does boast an incredible 19 state champs, some native trees, some not. Your narrator at the final resting place of two of Ohio's most accomplished biologists, the Braun sisters, Annette and Lucy. I had only visited Spring Grove a few times prior, and never had had time to track this spot down. This time, we knew right where to go and made the pilgrimage to the Braun's final resting spot a priority. Quite fittingly, their graves lie in the shadow of that massive oak in the previous photo. Although purely coincidental, I am sure, the look and placement of the tombstones mirrors the sisters' real life relationship. By all accounts, Lucy was more forceful and dominant, while Annette was laid back and soft-spoken. Lucy's headstone is bolder, and placed just ahead of Annette's paler, less conspicuous marker. Emma Lucy Braun, 1889-1971. She was, without doubt, one of Ohio's - and North America's - preeminent botanists. Lucy began operating at a time when women scarcely had a toehold in the biological sciences, and their involvement was not often encouraged. None of this would have mattered a whit to Lucy, with her forceful personality, and I'm quite sure she would have been successful at whatever she had put her considerable mind to. Lucy had many publications and other accomplishments to her credit, but this book is undoubtedly her most famous work. 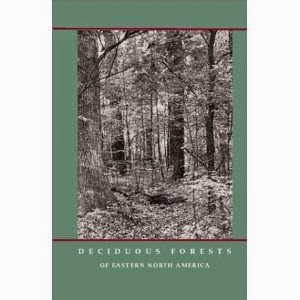 Deciduous Forests of Eastern North America was published in 1950 and instantly became the gold standard of eastern forest ecology. It remains highly relevant to this day. 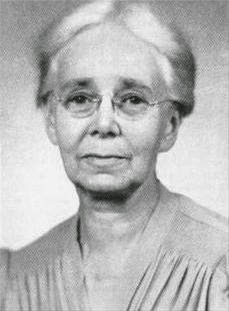 Lucy Braun wrote three other books, and at published at least 180 papers and articles over her career. But probably first and foremost, she was a FIELD biologist - something that unfortunately is becoming a lost art these days. She reveled in exploring the wilds, finding and learning plants, and attempting to figure out the big picture. 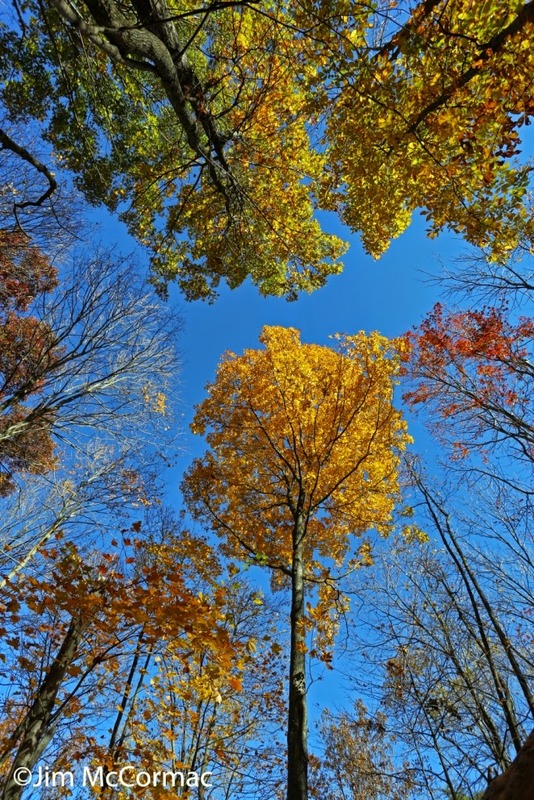 That's why her magnum opus, the Deciduous Forests of Eastern North America, is such a standout. In it, Lucy adroitly synthesized all of her years of field work and knowledge into a coherent dissection of a big and complicated subject. Along the way, she discovered a number of new plants or varieties thereof, with perhaps the most famous being the rockhouse white snakeroot, Ageratina luciae-brauniae. B.E. Wofford, who elevated this taxon to species level in 1976 - other botanists had probably incorrectly treated it as a variety of another species - left no doubt about who deserved credit for the species' discovery with his choice of scientific epithet. 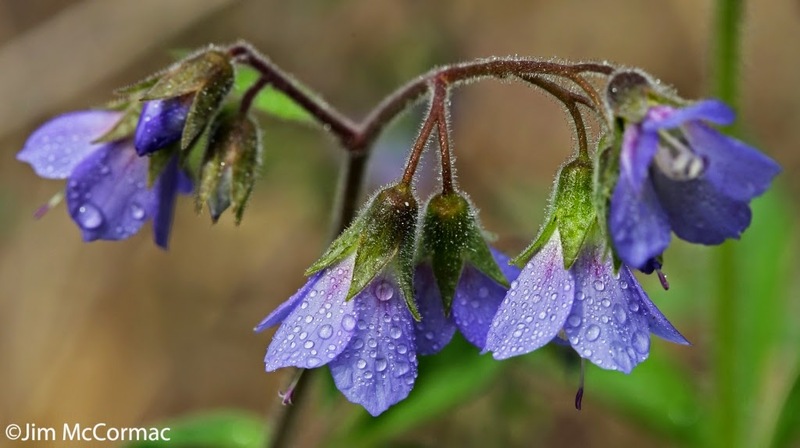 The gorgeous plant in this photo is greek valerian, Polemonium reptans L. var. villosum E.L. Braun. Lucy first recognized this distinctive variety and published it, hence her authorship behind the varietal name. Braun's greek valerian is a rather rare and local plant in Ohio, but it can easily be found in Shawnee State Forest, which is where I made this photograph. Amazingly, Annette was probably even more productive than her dynamo sister, although she sometimes gets lost in Lucy's large shadow. 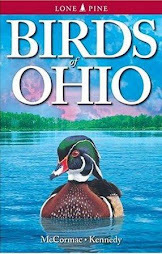 Annette often accompanied Lucy on her field trips, and many of those were to the prairies of Adams County, Ohio, which is a biological wonderland. Annette's thing was moths, specifically the microlepidopterans (really little moths!). Her accomplishments in this little studied realm were staggering. 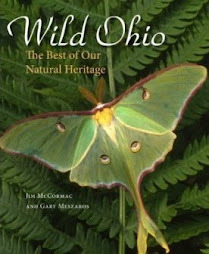 Annette described some 335 moth species to science, and published scores of scientific papers, including four major monographs. In the world of lepidoptera, she was a true giant. I made this image of this tiny caterpillar in one of Lucy and Annette's beloved Adams County prairies back on July 25, 2012, and the obscure larva ties together the two sister's interests nicely. The animal is known as Ethmia longimaculella, and it is in a group of moths that was of great interest to Annette. 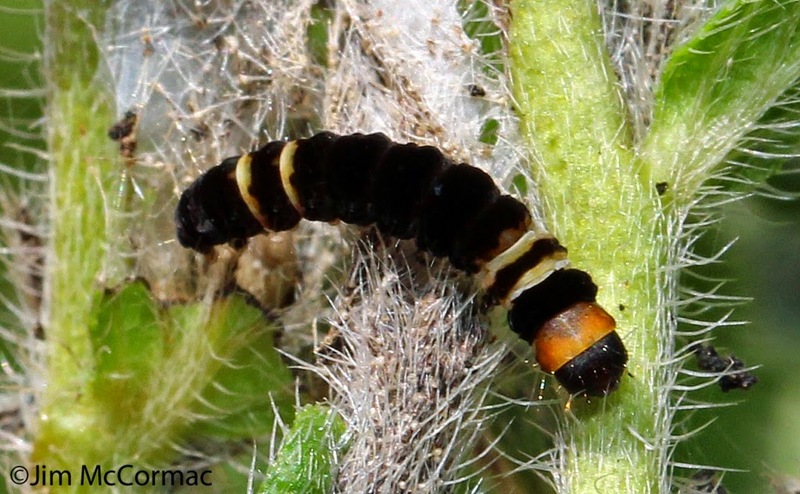 The caterpillar feeds on a plant that surely caught Lucy's eye, the false gromwell, Onosmodium molle, which for us in Ohio at least, is a rather rare prairie inhabitant. Lucy would have examined the plant, while Annette studied its larval predators.